To calculate the corrected QT Interval (QTc) enter the duration of the QT Interval (milliseconds) and Heart Rate. This formula is only valid for Electrocardiograms with Regular Rhythm. Prolonged corrected QT: Greater than 460 ms in children under the age of 15, 450 ms in men, and 470 ms in women. Short QTc Interval: Less than 340ms is accepted as pathological. 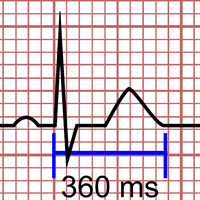 Enter the measure of the QT Interval (from the beginning of the QRS complex to the end of the T wave) and the Heart Rate of the Electrocardiogram.